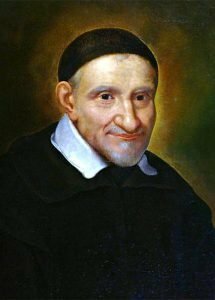 The Ladies of Charity was founded by St. Vincent de Paul in 1617 near Lyons, France. Poverty, sickness, and great hardships were rampant among the general populace in the city and villages. St. Vincent, a parish priest, realized that charity must be organized so that valuable donations not be wasted. 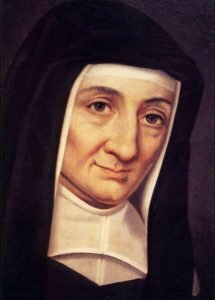 He and St. Louise de Marillac, led the “ladies of charity” in responding to the needs of the poor in seventeenth century France, and went quietly about their tasks, seeking no recognition, satisfied with the knowledge that they were serving Christ in the person of the poor. The Ladies of Charity, since its origin, has possessed the charism of its founder, demonstrated through daily prayer and personal service to the poor. That same Vincentian spirit characterizes the Association today. It asks the personal gift of self, of time, devotion, sacrifices, and perseverance in the effort to bring dignity to each person and to respond with compassion to every human misery. The first association of the Ladies of Charity in the United States was established by Catherine Harkins in 1857 in St. Louis, Missouri. By 1934 there were 2,500 associations throughout the world. Today there are over 6,500 members in 23 states plus the District of Columbia in the U.S., and over 200,000 members worldwide in 54 countries. In the early 1930's, the Ladies of Charity of Quincy was formed after several years of meeting informally. In the early years, members stored items in their own garages and visited the homes of the poor to minister to their needs. The Quincy association has undergone many changes over the decades. In 1960, the Diocese of Springfield made available to them a portion of a building at 510 Jersey. In 1980, construction was begun on the present Center building at 510 S. 4th, and it was opened in 1981. An addition was added in 1995. The Thrift Store was established in 1981. After renting at several sites, the organization decided in 1985 to purchase the 12th and Chestnut location. The Thrift store operated from that site for over 30 years. In 2016, the Ladies of Charity purchased its present Thrift Store building at 24th and Elm and moved the Thrift Store operation there in September, 2016. Since our Quincy beginnings over 85 years ago, the Ladies of Charity of Quincy has consistently addressed the needs of the under-served, unemployed and underemployed people in the Quincy area, regardless of race, creed, color, or country of origin. During the 2016-2017 fiscal year, the Ladies of Charity of Quincy provided services to households representing an average of 2251 people per month. 4,828 food orders were filled in the course of the year, and 941 packages of 15 diapers were distributed upon request. Our services include: providing food, clothing, bedding, household items, newborn layettes, diapers, and personal care and hygiene items. These offerings are available Mondays and Fridays. During this same year, nearly 120 active volunteers donated about 22,000 hours of service to the Ladies of Charity of Quincy. With over 150 members, Ladies of Charity of Quincy continues to serve in the spirit of St. Vincent de Paul and St. Louise de Marillac.